Many of these "comedy slice of life" series are an examination of the characters and their relationships with each other. The Chronicles of the Going Home Club really isn't about that. The characters in this series are more like a medium from which they serve up some kind of (usually amusing) commentary. I find that the jokes in this series have a subtle maturity and sophistication that you don't see in a lot of anime. The interesting thing about this series is that its humor is rather subtle and is actually extremely witty. Rather than relying on tired situational comedy tropes such as dealing with "the embarrassing girl who has a crush on her best friend" or "boy falls into a girl's chest" or "girl's so random just because, and it's funny! ", the series makes jokes about historical leaders and their short poems, teenage angst, evolving social norms, and anime cliches. There's a lot of fourth-wall breaking going on in this series. If you've watched enough anime to be rather tired of these cliches, then it's rather amusing to see them pointed out in this series. So really, the joy in this series isn't that much about the characters - as I mentioned, the characters are more of a medium through which to serve jokes through than they are deep, meaningful archetypes. Natsuki is the "sane" one of the group and you can pretty much replace all of her lines with "WTF?!?" and the series would make sense; Karin is the demure, cute girl (and this gets played up, a lot); Sakura is the slightly-insane club leader, for whom EVERYTHING is a huge deal; Claire is a slightly-oblivious rich girl, and Botan is an exaggerated martial arts expert with superhuman abilities. The jokes do play the characters of each other though, and in that sense it's actually rather amazing that the writers can get so much mileage and variety out of them. Another amazing part is that none of the characters (except possibly the Seal mascot) are extraordinarily annoying. There are also a LOT of pop-culture jokes in the series. They're subtle but if you look for them it's actually a blast. The one ones I've managed to identify were video-game related (there's at least a Touhou reference and a Super Mario reference) but a series like this is probably buried with them. A lot of the other reviews of this series are reasonably low, and I have a feeling that it might take a certain type of person to really enjoy the humor in this show. I personally enjoy it a lot. It's much more up my alley than a lot of the other cutesy comedies out there! I've seen that some people stopped watching after the first episode. That's a total mistake. This show is a blast. It's true that some of the characters lack development but, the show is a laugh riot. Give it a few more episodes and the humor definitely becomes more polished. What sets Chronicles apart from other gag manga adaptations is a willingness to 'go with the flow' in later episodes and daring, tonally elevated gags that give the show more character than other just-jokes programming. It's definitely scatterbrained, as other viewers mention, but I like to think it provides variety and keeps any jokes for going on too long. Also, did we forget the common Western cartoon format? Some part of me expects people expected a show with more plot for moe delivery and reacted unfairly (though I'll admit that could be an unfair sweeping judgement). It also improves over time, which deserves an extra star on top for effort. Going home is going well. . .
Another school club anime, but nicely done. 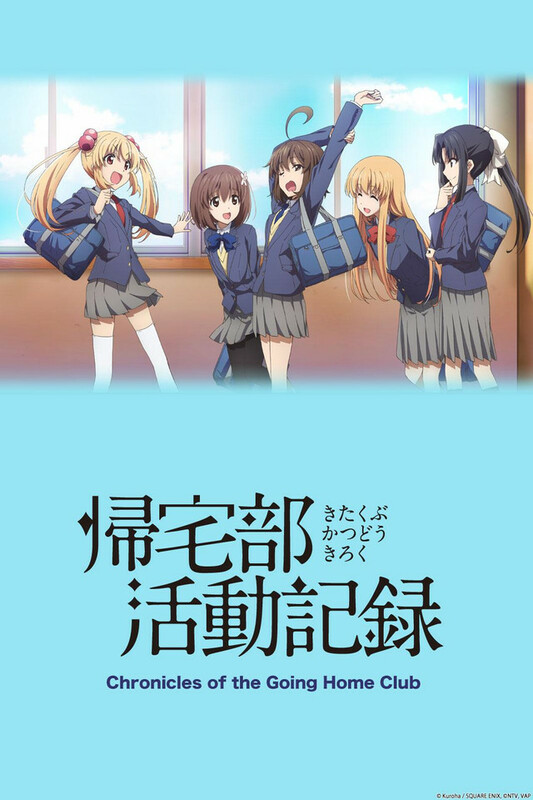 Unlike so many others, however, this show focuses almost entirely upon club time, to the near-exclusion of seeing the characters at home or involved in normal school activities. The humor is often subtle, despite the writers' obvious love of puns, and reflects a lot of pop culture influences. The cast is an ensemble of five arch stereotypes (the pampered rich girl, the warrior, the naive freshman, etc. ), but their personalities blend well. If you liked YUYUSHIKI (and I did! ), then this series might well be worth your time. I personally like this anime. You have your usual straight man in a room filled with comedic characters that act as though what they are doing is normal. The references that they show are also well done. This reminds me of Gintama and Sket Dance in a way where they talk and do absolutely nothing. I recommend that you watch this series as it gets interesting the more that you watch. I almost skipped this show because of the terrible (by CR standards) rating. I'm glad I didn't. When it comes to completely mindless fun this show is amazing. Yes, there's very little character development; yes, there's a similar character-scape to most other slice-of-life shows. But this show isn't trying to be anything new, it's just trying to make you laugh. If you don't mind having the fourth wall blown all to hell (or barely there in the first place) give this show a shot. Sometimes you just want an anime to relax to and enjoy. You don't want serious plot, you don't want crying and romance, you just want something entertaining. Chronicles of the Going Home Club is a fantastic anime that doesn't care to make any sense and loves to make fun of itself. Try it out, give it a chance. It's a riot. if you're looking for deep plots or continuous storyline this isn't it. It is just gags and fun. This is one of a kind unique. For when you're tired of the emotionally draining amines. If you notice all the bad reviews are from people who only watch one or two episodes and they just don't get it. Here's to good sense of humor. This show is very sporadic and random and it seems to skip around a lot but this is mainly due to the fact that it is based on a 4-koma manga. A lot of the negative reviews are all complaining about lack of plot or character development which is stupid. This is a high-school, comedy, slice-of-life show so those kinds of things aren't needed. It's comedy and a pretty good one at that. Most of the characters fall into the typical archetypes so it may seem unoriginal at first, but the characters in this show really take it to the extreme. Overall it's not anything new or ground breaking but it is relaxing and fun to watch. The Chronicles of the Going Home Club is a really nice anime. It is very funny and refreshing. This is exactly what a slice of life anime is about, showing many occurrences from this hillarant characters. The situations this group of girls are in are definitely comic. I totally recommend this anime, watch it till the end!